Thanks to the efforts of the Chuckanut Conservancy's North Cascades Corridor Project (NCCP) and related work over the past decade, conservationists have begun to recognize a unique opportunity that exists to protect and restore a large regional landscape of wooded foothills, meadows, wetlands, lakes and streams in an area referred to as the "North Cascades Corridor." Straddling the Whatcom/Skagit County line in northwest Washington State, the area forms an ecologically important divide between the Skagit and Nooksack River systems, providing habitat for a wide range of low to mid-elevation flora and fauna. Generally, such areas are poorly protected within Washington, especially at a larger landscape scale. The North Cascades Corridor may represent one of the best opportunities in our state to protect, enhance and restore a regional west slope ecosystem extending from the Cascades to the sea. 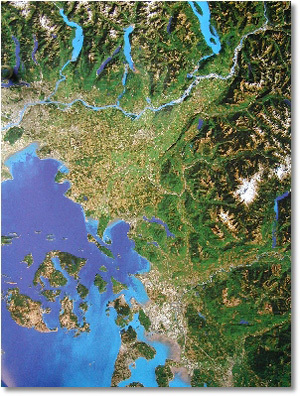 The corridor consists of a broad uplift of forested foothills that extend all the way from Mount Baker and the high alpine country to the east, to the Chuckanut Mountains and Georgia Strait (or Northern Puget Sound) to the west. It is the only place in the Pacific Northwest where the foothills of the Cascade Range extend all the way to saltwater. More than 200 square miles of wildlife habitat and many miles of salmon streams exist within the North Cascades Corridor. Natural breaks at Lake Whatcom and the South Fork of the Nooksack River provide critical regional links and add to the broad array of habitats available to migratory birds, large and small predators, anadromous fish, amphibians, and other sensitive or imperiled wildlife. Substantial habitat links still exist between the North Cascades Corridor and adjoining protected areas, although that is not to say that development and resource exploitation have not had major effects on the environment that exists today. Much of the Cascade foothills has been committed to intensive timber management and road-building for more than a century, and growth and development are consuming the lowlands and lower foothills of the Puget Trough at a rapid clip. We are just now beginning to truly assess the real long-term damage, the environmental costs that were so readily overlooked in the past. In the context of salmon recovery especially, we are as focused as ever on the impacts we, as a society, have had on both aquatic and terrestrial ecosystems. While there is much we are still trying to assess and understand, we do know that meaningful, large-scale protection and recovery of these stressed ecosystems and habitats is still possible. Protecting the North Cascades Corridor does not necessarily mean outright preservation of the entire region. Extensive private ownership would render such a goal cost-prohibitive and impractical. However, through the preservation or restoration of key habitats and wildlife corridors, combined with public policy changes, conservation easements, land acquisition, and an aggressive educational program to encourage ecologically sustainable development (as best we can define it), we may be able to guarantee long-term viability of the Corridor ecosystem. In Whatcom and Skagit Counties, despite a long history of logging, mining, agriculture, human settlement, and other development, substantial areas remain largely untouched since vast stands of old-growth forest were first cut-over in the late 1800s and early 1900s. Some forest lands, including many thousands of acres of state-owned forest, have reached age classes greater than seventy years, and small amounts of old-growth forest and other relatively pristine habitats still exist. Few paved roads penetrate the Corridor and urban-level development is largely non-existent. The Corridor also offers exceptional opportunities for recreation, including hiking, biking, wildlife viewing, canoeing, kayaking, rafting, and a long list of other low-impact activities. Plans have been drafted for both regional and localized trail systems, including a multi-agency master plan for an 80-mile nonmotorized trail system in the Chuckanut Mountains south of Bellingham. Important historic and cultural values also exist, though not well documented in many instances. Scenic values are very high, especially in the vicinity of Mount Baker and the Twin Sisters Range, in the South Fork Valley, around Lake Whatcom, and in the Chuckanut Mountains and Blanchard Mountain, where at 2,000 feet above sea level, atop a 300-foot cliff at Oyster Dome, one can enjoy a naturally unobstructed view of the San Juan Islands and three mountain ranges (Cascades, Olympics and B.C. Coast Range). 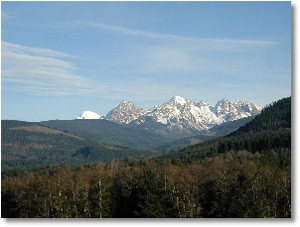 A great deal of conservation work has been accomplished in and around the North Cascades Corridor in recent years, including preservation of the two largest remaining stands of privately-owned old-growth; public acquisition of park lands and other extensive forest lands in the Chuckanut Mountains; ongoing conservation initiatives in the Lake Whatcom watershed; acquisition of an historic homestead and more than two miles of adjoining riparian habitat along the South Fork Nooksack River; and designation of a regional park and preserve at Squires Lake. A citizen-led effort seeks to transfer between 3,100 and 4,800 acres of Washington DNR-managed land in the Chuckanuts to Natural Resources Conservation Area status or an equivalent level of protection (see Blanchard Mountain for more). The City of Bellingham has developed a land-acquisition program in the Lake Whatcom watershed to ensure protection of its municipal water supply. Efforts to restore threatened salmon runs, to clean up Puget Sound, and to create a marine sanctuary in the Northwest Straits will also likely benefit the future integrity of the Corridor. The Corridor Project is a grassroots-driven initiative to address biodiversity, threatened ecosystems, wildland recreation, water quality and sustainable development issues at a landscape level. Perhaps nowhere else in Washington State is there a more favorable opportunity to protect and restore, from craggy summit to glimmering tidepool, an ecologically intact corridor of this magnitude.